May 14, 2018 May 15, 2018 ~ Steve N.
Have you seen the video series Upstate Old School Vic Christopher is doing for Two Buttons Deep? In the first episode, he visits O’Scugnizzo’s Pizzeria in Utica. 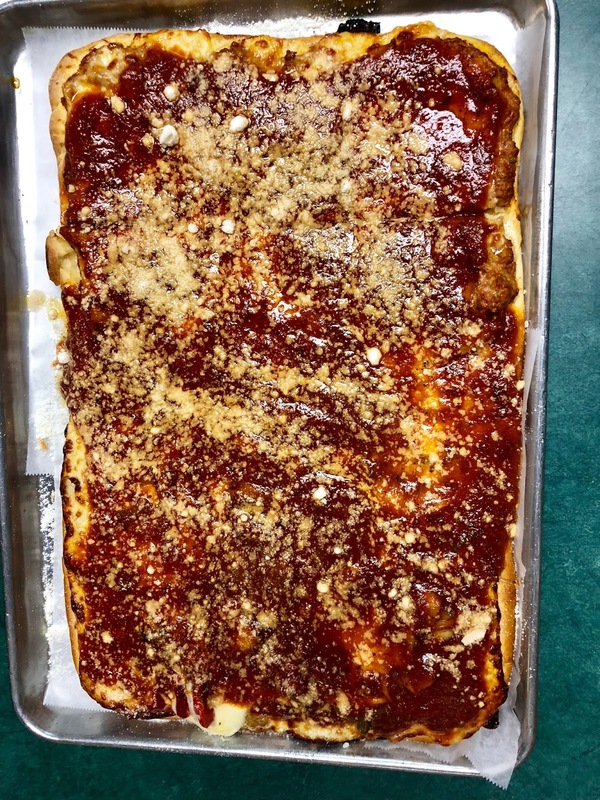 O’Scug’s makes a form of Utica tomato pie, and the place is the second oldest continually operating pizzeria in the US. The video is less than four minutes long. It’s worth a watch. Barely one week after Vic’s video was posted, Daniel B. and I had some business together in Central NY (more about that at a later date), and after seeing the video, both of us were curious to visit O’Scug’s and experience the pizza. I was not impressed, and frankly, perplexed as to why O’Scug’s is popular. “I was standing in the seating area, peering into the kitchen, and I saw the dude pull out a partially baked dough rectangle for our pizza. I don’t know if they’re made in-house, maybe they are, but it doesn’t matter. And I was disappointed to see that they’re not making pizza from fresh dough, but rather throwing toppings, cheese, and sauce on a pre-made dough square they keep under the counter in a plastic bag. After Daniel and I ate a few slices of our 12 cut, we split the remainder and took them home. Now, you can imagine after such a bad experience, I was in no hurry to eat the pizza again. The leftover slices sat in my fridge for six days before I finally decided to eat them. They were on the verge of spoiling, and I almost threw them out. I’m so glad I didn’t throw them out. I heated the slices briefly in a 375-degree oven. I left them in there just long enough to warm them through and take the chill off. The pizza was transformed from hard to eat, to a joy to eat. The crust softened up and became pleasantly chewy, yet the bottom still maintained it’s crispness. The sauce, cheese, and toppings, (which when right out of the oven were disconnected from the crust), all melded together with the crust to become more than the sum of its parts. It was like I was eating an entirely different thing. It was delicious. O’Scug’s pizza needs to be eaten at room temperature, or at best lukewarm. And in fact, I’m willing to bet that almost no one eats the pizza right out of the oven there at the restaurant. I’d wager the majority of their business is take-out. I don’t do take-out pizza. Most pizza degrades on the ride home, it steams in the box, the crust becomes soggy, and the cheese starts to get rubbery. But O’Scug’s pizza doesn’t suffer those problems. Quite the opposite, the pizza improves as it cools. O’Scug’s breaks my written in stone rule that pizza should be eaten as soon as it comes out of the oven. I’m planning on making the trip out to Utica again soon; I want to try more Utica tomato pie (most of which are served room temp). I’ve never been a fan of room temp pizza, but O’Scugs may have changed my mind. As a native Utican, I can attest to the fact that tomato pie was never served at anything but room temperature. I’ve had many a pie from O’Scug’s – my mother would pick them up on her way home from work. She would arrive home around 4pm, and that thing sat on the counter for two plus hours until my father got home. We never consumed one hot – I honestly can’t imagine what a hot pie would taste like. Much like an Italian mix sub, it becomes better and better as time passes and the ingredients become something greater than the sum of their parts. Like your new format Steve! So much easier to read when it’s not reversed out!